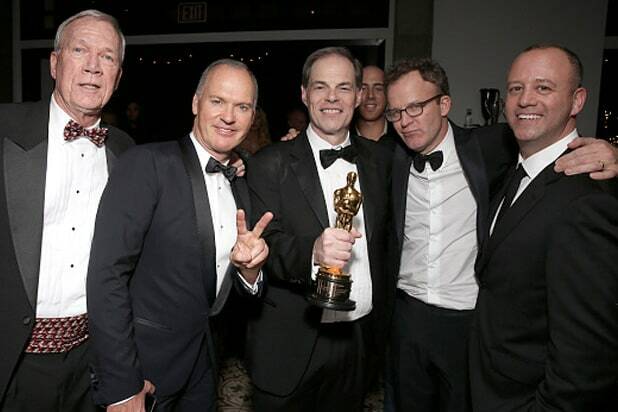 Walter 'Robby' Robinson and Michael Keaton, Open Road's Tom Ortenberg, Director Tom McCarthy and First Look's Michael Bloom. Tang Media Partners has acquired Oscar-winning independent film distributor Open Road Films, best known for releasing the art-house hits “Spotlight” and “Nightcrawler” despite posting nearly $100 million in losses. As part of the deal, announced Monday, Open Road’s Tom Ortenberg will continue as the motion picture company’s CEO. Tang Media — a China-connected firm founded by in 2015 by Donald Tang, a former chairman and CEO of Bear Stearns Asia — bought Open Road from AMC Entertainment Inc. and Regal Entertainment Group as part of a larger, overall $500 million expansion plan. The two exhibition companies launched Open Road in 2011 with the goal to release filmmaker-focused and prestige titles throughout the year. Its biggest success was 2016’s “Spotlight,” which earned nearly $45 million in the U.S. and won the Best Picture Oscar. Earlier this year, both AMC and Regal indicated that they were exploring a sale after valuing their losses in the joint venture at more than $49.1 million each in financial statements — a total of $98 million. The sale comes a week after fellow indie distributor, Broad Green Pictures, laid off 20 percent of its staff and shuttered its production division after suffering a series of flops at the box office. Upcoming Open Road releases include the animated family comedy “The Nut Job 2,” “Home Again,” starring Reese Witherspoon, and “Marshall,” which stars Chadwick Boseman as Thurgood Marshall, the first African-American Supreme Court Justice. Up until the final moment of the Oscars, we never thought that Warren Beatty would be the most in-demand person after the show. 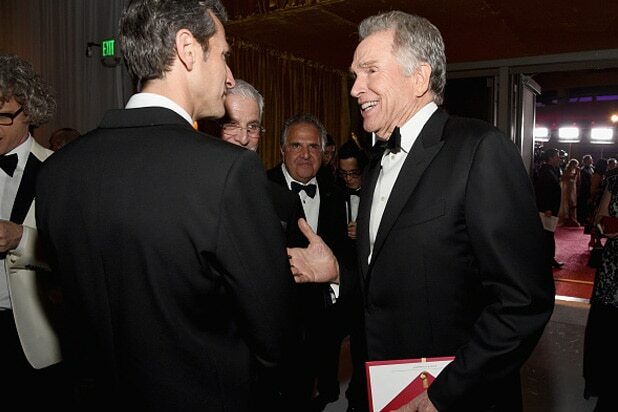 Curiously still holding an envelope, a group including Fox Studios chief Jim Gianopulos surrounds Beatty at the Governors Ball upstairs from the show at the Dolby Ballroom. Jordan Horowitz, the "La La Land" producer who graciously halted the acceptance speeches and showed the world that "Moonlight" had won, hugs the film's director Barry Jenkins at the Governors Ball. No controversy here: Viola Davis poses outside the entrance. And let her brother Spencer carry it around. Casey Affleck gets his Best Actor Oscar engraved in the winners' circle at the Governors Ball. From the "Good Will Hunting" crew of Ben Affleck, Matt Damon, and Casey, the "Manchester By the Sea" lead is the only one to ever win an acting Oscar. "Moonlight" director and co-writer Barry Jenkins puts his ear to the gold. Is he trying to hear the ocean? Jenkins gets ready to go social with his Oscar. He later tweeted "Jordan Horowitz. Wow. I'm slipping slowly into reflection, perspective. Much respect to that dude"
Leonardo DiCaprio (at the Gov Ball, where Hillhaven Whiskey and Piper-Heidsieck flowed) was mildly mixed up in the great Ocsar Flub of 2017, as he presented Emma Stone her Best Actress Oscar. For now, he looks glad to be a veteran Oscar winner. No despair for Damien Chazelle (with girlfriend Olivia Hamilton). He won Best Director. Two thirds of the "Hidden Figures" lead trio: Octavia Spencer and Janelle Monae. Monae gets a visit from Helen Lasichanh, Pharrell Williams' wife. Helen Lasichanh, Pharrell Williams, and Spencer. Around this same time, Janelle Monae was sitting with her "Hidden Figures" castmates. She was also in Best Picture winner "Moonlight". Over at Elton John's bash, the fundraiser-in-chief sang with St. Paul & The Broken Bones. EJAF regular Sharon Stone, already tall, stood on a chair for a better view of the performance. Immediately after the telecast's shock ending, Sir Elton got on the mic to address a stunned crowd and begin the auction portion of the evening. "As much I wanted 'Moonlight' to win, we have to feel bad for 'La La Land'," Elton said. "So tough to give it back." He then went on to honor the other nationally televised shock ending to the only television event of the year bigger than the Oscars: The Super Bowl. Elton called out Patriots owner Robert Kraft and congratulated him on their recent Super Bowl comeback win. Fraternizing with the enemy: Robert Kraft, a pregnant Ciara, John, and Seattle Seahawks quarterback Russell Wilson. The Patriots snatched a Super Bowl win from the Seahawks two years ago with an improbable goal line interception. When Sting rolled out of West Hollywood Park just before midnight, the singer, wife Trudie Styler, and their entourage piled in to one SUV. While Sting said "I'll take the front," and hopped in shotgun, three of his friends opted for the caboose. Three of Sting's pals left Elton John's party the same way kids get stuck in a carpool: in the "way back". This could not have been the plan. Audi continued their long relationship with the EJAF as they shuttled celebrities and VIPs to a closed block of San Vicente Boulevard for arrivals at West Hollywood Park. Back inside, publicist Milan Blagojevic (right) helped shore up an Adriana Lima sandwich. The "Victoria's Secret" fashion show comes to West Hollywood: Alessandra Ambrosio, Adriana Lima, and Josephine Skriver. The fashion community has been a long time supporter of the Elton John AIDS Foundation's mission. EJAF Chairman David Furnish, John, chef Gordon Ramsay (who designed the menu that chef Wayne Elias cooked over the last four days), and Ramsay's teenage daughter Holly. Big Sean and Karrueche Tran flank the host, who raised $7 million on Oscar night for action-oriented, evidence-based AIDS programs and policies to end the epidemic. Where Smokey Robinson had a choice seat alongside Universal Music Group chairman Lucian Grange, Sharon Stone, and Luke Hemsworth. Bvlgari, Neuro Drinks, Chopin Vodka, and Audi sponsored the event. At Delilah in West Hollywood, Amazon celebrated their three wins. Kenneth Lonergan, power publicist Mara Buxbaum, and Casey Affleck. Amazon SVP Jeff Blackburn, Worldwide Head of Motion Pictures Amazon Studios Jason Ropell, producer Kimberly Steward, producer Lauren Beck and producer Kevin Walsh surround Affleck at the bash where flip-flops were handed out to tired party-goers. Over at Vanity Fair's bash in Beverly Hills, Katie Couric, Michael Keaton, and John Molner may have been checking out GIFs of the on-stage chaos during the Best Picture snafu. Elizabeth Banks, Amy Adams, and Reese Witherspoon turned the cameras around the other way, shooting a two-camera selfie. Comedy hall of famers Sacha Baron Cohen and Larry David pose inside Graydon Carter's impossibly exclusive party. Personal cameras are treated like contraband inside VF, so here's a shot arriving on the carpet. Known for having multiple social areas, the boys huddled up in one corner of the tent: Justin Theroux, Tom Ford, Orlando Bloom, and Lee Daniels. Caitlyn Jenner, James Corden, and iconic transgender model Andreja Pejic. Darren Le Gallo and Amy Adams would hit the dance floor. Adams' "Arrival" took home one Oscar, for sound editing. This would be useful for cleaning up after eating an In-N-Out Burger. Per usual, VF had the burger chain's truck pull up for the end of "industry lent" - where famished actors and dieting industry types can finally inhale food now that awards season is over. "The Salesman" wins gold: This is the foreign language film whose director boycotted the Oscars in protest of the Republican administration's travel ban. In a smart behind-the-scenes campaign move, Charles Cohen (with wife Clo) sent screeners to all Academy members before Thanksgiving. Circus Magazine, a film magazine debuting later this year, threw a party at the Absolut Elyx house in the Hollywood Hills. It's been the scene of many late-night bashes this awards season. We're still not entirely sure how Warren Beatty is to blame, but former Obama chief speechwriter and "Pod Save America" host Jon Favreau immediately tweeted: "Also Hillary just won Wisconsin Michigan and Pennsylvania? ".